To those country fans that know the name, it looms large. But the truth of the matter is, not many know the name. 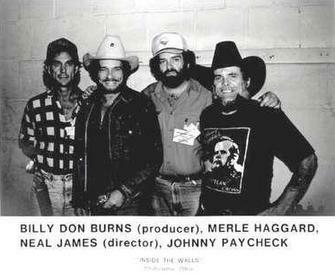 They know the names of Merle Haggard and Johnny Paycheck—two men who Billy Don Burns has produced albums for. 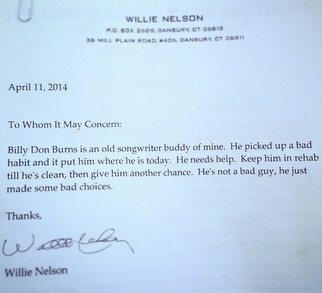 They know Willie Nelson and Johnny Cash—two acquaintances of Burns who on separate occasions, wrote touching letters for him. They recognize the name Hank Cochran, who Burns once owned a publishing company with for many years. And the list of the friends and associates and important accomplishments of Billy Don Burns from over the years continues on from there, and includes a veritable who’s who of American country music throughout the 70’s and 80’s. But at this moment, the 66-year-old songwriter’s name remains anonymous to many, and has been replaced by a number: “PID # / DOC #: 356205 / 276249”—the numbers assigned to him by the Kentucky Department of Corrections. In 2012 when Saving Country Music reviewed Billy Don’s latest album Nights When I’m Sober, along with a list of his county music acquaintances and accomplishments was a word of warning on why Billy Don wasn’t as well known as many of his famous friends. The demons that have pursued Billy Don throughout his life and career, dogging his successes with lapses into addiction and destitution make the start and stutter nature of his career understandable. Those battles are also what have fueled and elevated his status as a songwriter in certain circles. He’s deity-like to the people who know and love him, yet the general public is unfamiliar with the name (though they may recognize music he’s written or produced). Billy Don Burns is a force behind the music. In 2014, those demons caught up with Billy Don Burns once again. It began with a charge for possession of a controlled substance, 1st offense. Billy Don was caught with methamphetamine in Kentucky, and a judge sentenced him to probation and released him from custody. The word was Billy Don was clean and had every intention of staying that way, but he decided he wanted to clear his head by hopping on a motorcycle, and driving across the country to see his son in California. Unfortunately when he got pulled over in the small New Mexico town of Tucumcari along old Route 66, they found out Burns was not supposed to leave the Kentucky/Tennessee area, and he was arrested once again. Billy didn’t have any drugs on him; he just wanted to see his son. Once again Billy Don was behind bars instead of furthering his career. Willie Nelson had written a letter to the judge to show leniency, and to choose treatment over confinement. It all came at a time when a documentary was being put together about Billy Don’s life. The State of Kentucky wouldn’t grant the filmmakers access to Billy Don in prison as part of the film. The plan is for Billy Don Burns to work at Rodgers’ studio for employment once he’s released, and to record new music. Rodgers says that in conversations with Billy Don since his arrest and incarceration, he feels that spiritually, Billy Don has put the drug use behind him, and is looking forward to starting a new chapter when he is released. According to the Department of Corrections in Kentucky, Billy Don could be released as early as July 4th, 2016, or as late as February 10th, 2017. He was convicted on a two year sentence. In the late 80’s, Kenny Buttrey (R.I.P. ), Bob Dylan’s drummer on the ‘Nashville Skyline’ album told me that if I wanted to do the good drugs, to get a nurse to administer them. So, I did. When I broke up with her, I had the habit. I shot drugs for over thirty years. I don’t steal. I bought them with my own money. They took all the pain I had away. I never got caught. I got caught twice last year. One one of them, I ran. I got sentenced to two years. I only had to do a year. I’m not proud of that. One thing I can say is the drugs I bought, I bought with my own money. That’s behind me now. I can take no more being persecuted by the state. I’m off them now. The music has been my life. I feel like I didn’t have a choice, that it choose me. Two artists I grew up on the most were Hank Williams and Johnny Cash. There have been dozens of others from Lefty Frizzell, Willie Nelson, Bobby Bare to John Fogerty. When Willie cut my first tune in 1991, “I Don’t Have A Reason To To California Anymore”, he told me that I could make a living just doing my own songs, and he told me I was a great writer. I’m the luckiest guy in the world. Harlan Howard signed me as a writer, and Hank Cochran and I had a publishing company called “Hank & Me Music” for six or seven years. I could always play Nashville, and the greatest writers in the business would always come out to hear me. They know I never write commercially. I write from the heart, and will probably never have the “big one”. But that’s okay. If I die tonight, it was wonderful. The biggest thing that ever happened to me was when Johnny Cash wrote me a letter. I cried like a baby. Willie Nelson wrote a letter to The Department of Corrections of the State of Kentucky and told them I was a good guy, just picked up some bad habits along the way, and to have mercy on me. 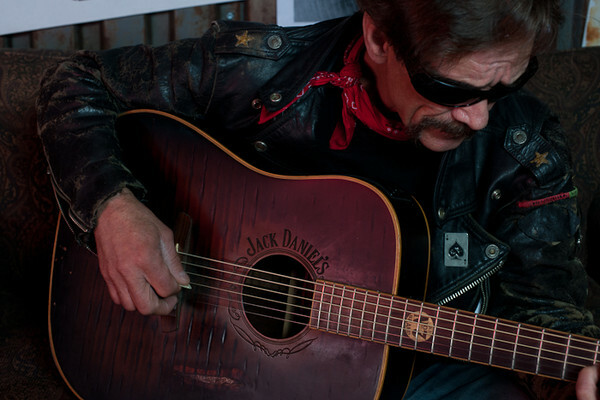 I’ve played honky tonks all over the world for 45 years. I’ve played thousands of them, been stabbed 17 times and had a deviated septum when I was beat, and damn near left for dead. The music has been good to me. What has kept me going are people telling me what my songs mean to them, and how my songs have changed their lives. When Shooter Jennings called me, and asked me to tour with him, his wife was behind that. He told me his wife bought my Heroes, Friends, and Other Troubled Souls album in 2006. She told me it was life changing. If I die tonight, it was great. If I never have any more success, it has been great. I find it odd that Terry Jennings is not mentioned but Shooter is? I thought Terry was managing Billy Don now? Figured he would play some part in his story? Just curious. Just saw him last night with Colter Wall in Athens, GA – was a cool old bear. We saw Billy Don at the Opry in 2013. Shooter Jennings brought him on stage and introduced him. I didn’t know who he was at the time but his performance moved me to the core. Since then his music is always on rotation at our house and continues to move me greatly. Can’t wait to hear his new music. He’s a great singer/songwriter. I got to meet Billy Don this year when he was on that California trip. He played a small circuit of small shows in small towns. I was one of four people in the audience. I had no idea who he was but was totally floored by his writing. I wish I had known his history before I saw him so I would have realized who I was seeing perform. Great update and article Trigger! Thanks! Billy Don Burns is both a friend and a mentor to me. I’ve been to see him in Louisville every month since he’s been locked up, and am going back this Sunday. A few things: BD is planning on being released in Decemeber of this year. He has two months “on the books” after his Dec. release and then, according to BD, this whole mess is behind him. He’s booked to play the Westport Roots Festival in Kansas City in May of next year, just set that up for him yesterday. Finally, Terry Jennings is no longer managing BD. I’ll let BD go into the reasons why, it’s not my business to post on the Internet, but no, BD no longer has ANY affiliation with Terry Jennings, Korban Music Group, Waylons Son Music, or any of Terrys company’s. Smart move on his part. Thanks Josh. I had the pleasure to see BDB at a Shooter/Waymore’s Outlaws show. BDB stated during his performance that Shooter “posted his bail” (he did say the amount, I wont) and was in essence given charge of BDB that part of the deal was he say off drugs and stay busy touring (paraphrasing as it was over a year ago). He had very nice things to say about Shooter and his Dad. Not trying to stir the pot but what he said, when he said it, held the room in his hands. It was a pleasure to watch and listen to him. He’s been through a lot. he’s a touring musician right? how did that work during his probation? when he got popped in 2014..did he get handsy with the coppers or piss off the judge? this all seems really excessive for a first time possession charge. From what I understand, he got the 1st possession charge and was let out on probation. When he was picked up in Tucumcari, he was in violation of his probation for leaving the state. In most cases, that means the term of your probation comes due in full, which would mean he’s due two years in prison. Not seeing anywhere in his arrest records that there were any further charges than the 1st possession. still doesn’t add up. why prison instead of treatment? it’s a drug charge..first time, yes and non-violent im assuming too? is Kentucky that terrible? There’s no mention of any other crime, which there would be if it weighed into the sentence. If he skipped town on probation like we know he did, or went out on tour with Shooter Jennings while on probation as some people have alluded to here, then maybe the judge took that very harshly and that weighed into the decision, I don’t know. You also have to consider that at the moment, he may be at a halfway house instead of prison. This is still the South though, and these are the type of harsh sentences people are used to seeing. They shamed him and made him take a job to humiliate him. I won’t tell my friends business because it’s his job. He has never had any other job than songwriter and performer but my buddy took his licks because that’s how he was raised and he done his time and it’s about damn time folks let people pay for there mistakes and let them live. I met Billy only three months before he was arrested. I was with him in Tucumcari, New Mexico. When they took Billy away, I made a decision to stand by him throughout this ordeal. He has had a rough road with being locked up, yet he has handled it with the utmost dignity. We talk daily, sometimes two and three times. I am managing his website, and handling his affairs for him while he is away. He has been writing stories recently, sending them through the mail to post on FB. He lives for his family, his friends, and his fans. I read him his messages, and al the likes and the comments from his fans. Throughout the whole process, I have come to know a man like none other. His fans and his friends have been responsible for helping him get through this dark hour. Billy has put the hard drugs behind him. He is looking forward to his release in December of this year. His address is: Billy Don Burns 1515 Algonquin Pkwy Louisville, KY 40210. Thankyou Aaron Rogers for your help with this article, and a special thanks to Saving Country Music for this great article..what a gift. P.S. I just read it to Billy, he loved it! I saw Billy Don in upstate NY a few years back, in front of maybe 10 people. It seemed like the bar owner and I were the only one who knew who BDB was. I was incredulous, he was great. After his set we sat and talked, I bought his record and he gave me a handful of free shirts. Great guy. I thought he was in a halfway house or something of that nature last I had heard. I’m hoping he gets an early release. He’s one of the top 5 greatest songwriters of all time and it’s a shame he’s in this mess. You might be right about that. For legal reasons, I was asked to not give specifics when he might be released, and it may not be completely determined at the moment. Understood. These legal situations can get mighty tricky. Now that’s the way to write and perform the slow, moody song. Kyle is this the full address? I like to think I know a great deal about country music but this is the reason I come to this sight. I have absolutely no idea who this guy is. Always great when you read something that makes you dig deeper about a person who has had some excellent contributions to the genre. People country fans should be praising (whatever his troubles). The comments so far have only added to his legacy. Always makes me feel better to add to the intellectual knowledge on an important piece of country music. Hey Billy this is your aunt Cloy. I’m praying for you get a early release and that you stay healthy. I just saw Billy Don Burns last night. He opened for Whitey Morgan & the 78’s and Cody Jinks at Headliners. The audience should have been in rapt attention. Instead, they were noisy and fighting, for which Whitey chewed them out royally (“real men should be here to get laid, not to fight!”). 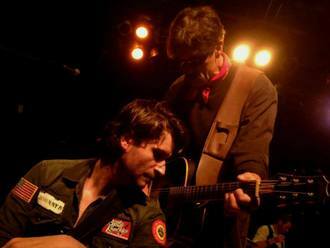 I saw Billy Don Burns open for Hellbound Glory the other night in Detroit. He was awesome. You need to go see Billy Don Burns if you get a chance. I know all about the south’s strict sentencing broken hearted mother in missouri!